Living near Zurich airport, Daniel Eichorn wanted an easy way to show his house guests what planes are flying near him. Usually he opens up his Flightradar24 app on his phone, but he wanted a more permanent always on display. To do this Daniel has built an ESP8266 based OLED display which automatically displays the ADS-B flight information of aircraft outside his window. The ESP8266 is a very cheap and highly popular WiFi module which can give a microcontroller access to WiFi networks. Daniel feeds his locally received ADS-B data to adsbexchange.com using a Raspberry Pi and RTL-SDR. While actually feeding ADS-B data with an RTL-SDR is not required to make the ESP8266 module work, this step ensures that he has good local coverage of his area. 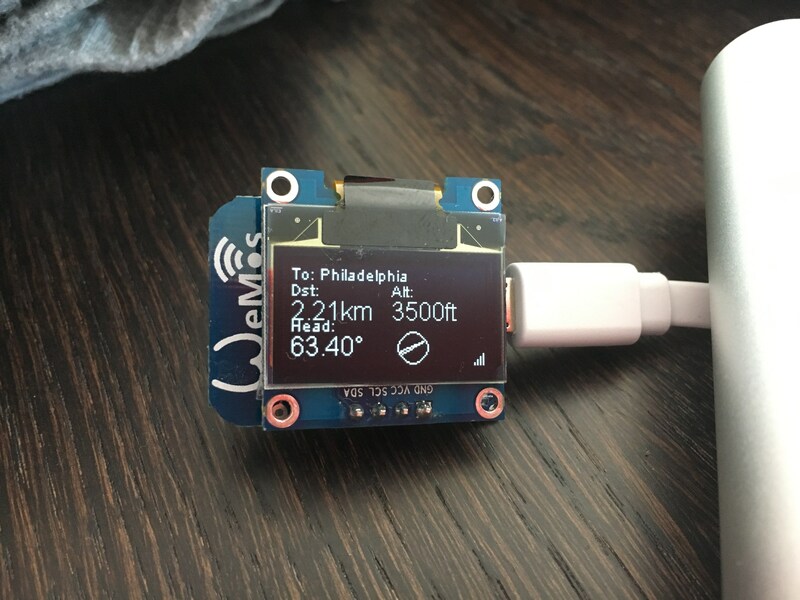 The ESP8266 module then queries the adsbexchange.com database via WiFi for information about planes in his area and displays the information on the OLED screen. In previous posts we also showed how the ESP8266 could be used to transmit data like NTSC TV in a similar way to Rpitx. ESP8266 + OLED screen displaying ADS-B data. Over on YouTube CNLohr has posted a video showing an interesting side effect of implementing ethernet on the ESP8266. The ESP8266 is a very popular $7 wifi module for microcontrollers that has found a lot of extra use outside of its intended design. Previously CNLohr also showed how Analogue NTSC TV could be broadcast with the ESP8266. Recently it was found that (software based) ethernet capability could be hacked into it. In his new video CNLohr demonstrates that AM radio can be broadcast by attaching a short wire antenna to the ESP8266 ethernet output, and then using an RTL-SDR to receive one of its harmonics at 150 MHz. He shows that by varying the size and speed of the packets he can change the received tones, and even create notes to play music. This essentially gives a simple way to ‘hear’ ethernet.